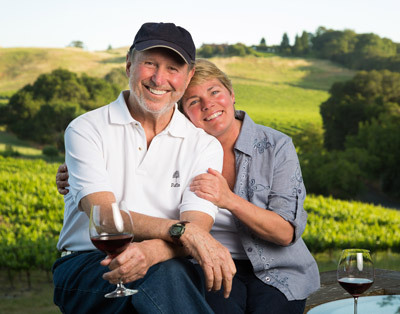 Joe and Karie Destein live on their vineyard in an idyllic little valley tucked away on the eastern reaches of Bennett Valley. We only get one ton of grapes from this west-facing slope, so there’s only a scant amount of wine that we make each year. Influenced by ocean-chilled winds blowing through the Petaluma Gap and situated on de-vigorating, well-drained loamy/gravelly soils the vines are naturally balanced and compact. Fruit from this vineyard gets ample hang time to allow flavors and tannins to develop slowly and with complexity. The entire block is planted to Dijon Clone 777. Download a fact sheet for the 2014 vintage.